Several years ago, I wrote an article for Print Magazine’s online blog Imprint about a book written by artist/cartoonist Edwin George “E.G.” Lutz – a 1920 manual titled Animated Cartoons – How They Are Made Their Origin and Development. According to several Walt Disney biographies (including The Story of Walt Disney by his daughter Diane Disney Miller, who misidentifies Lutz as “Carl” instead of E.G. ), Disney himself mentions having checked the book out of the library as reference and instruction for setting up his fledgling Laugh-O-Grams studio in Kansas City, Missouri. Lutz’s edition was evidently met with a successful response because it went into reprints through 1926, and has also had international releases in the United Kingdom and Germany. Lutz was a relatively prolific cartoonist and the author of at least 17 “how to” art themed books, which were published between 1913 and 1936. Yet, his Animated Cartoons stands solid as the first book entirely dedicated to the animation craft and industry. In order to document the process as he did, Lutz must have circulated through the industry studios and interviewed production talents of the time, but this couldn’t have been too easy to accomplish with so many studio artists and producers holding their methods and even patents close to their vests. Fig. 1. 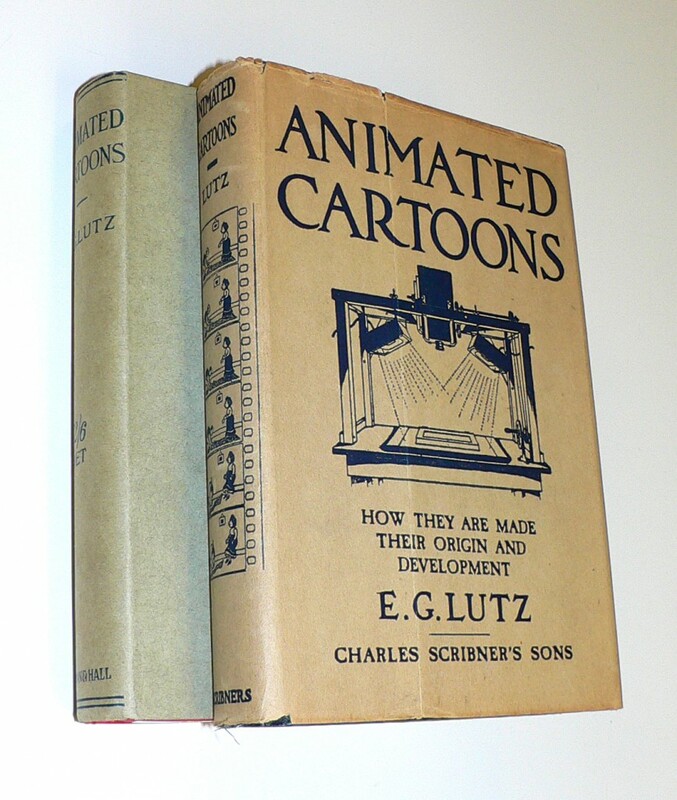 E. G. Lutz’s book Animated Cartoons. In your post “How Walt Disney Used His Kansas City Library Card,“ you wrote about my great-great Uncle Edwin. I’m writing to let you know that I have created a biographical website on E.G. Lutz. The site, Illustrating Edwin, incorporates family photos and records that were recently passed on to me as the current family archivist. A screen capture of the home page is attached to this message. As far as I was (and am) concerned, this was a dream come true. To be able to fill out the legacy of someone who contributed such a significant element to the animation industry was going to be a wonderful thing, and Frank has done a wonderful job filling out the biographic details of Lutz’s life and career that have been missing for so long. When visitors arrive on the Home page, they are provided with eight different headings that cover Edwin’s professional and personal life, a gallery of rare photographs, links to previous articles about Lutz, and a full bibliography of published works by the author/artist. Frank has also developed a virtual “Gallery” environment for future presentation of his great-great uncle’s artwork as well as “Comments” and “Updates” sections in the hope that the site will become an ever-evolving destination for people doing related research. J.J. Sedelmaier is the President/Director of J.J. Sedelmaier Productions, Inc., a animation and design studio that he established with his wife Patrice in 1990. It has created and produced some of the most influential broadcast productions in the past quarter century. MTV’s Beavis and Butthead, NBC/Saturday Night Live’s Saturday TV Funhouse cartoon series (including The Ambiguously Gay Duo), Cartoon Network/Adult Swim’s Harvey Birdman, Stephen Colbert’s Tek Jansen all had their beginnings at JJSP. In addition to TV network cartoon series, the White Plains NY studio has produced over 500 animated commercial films and won over 700 prestigious awards with screenings in over 100 festivals in 25 different countries. Sedelmaier is an experienced educator (NYU), curator of exhibits on animation and design, architectural preservationist with two structures on the National Register of Historic Preservation. He is a regular editor/author for Print Magazine’s “Imprint”. He is also a regular presenter at ComicCons throughout the USA and a subject of numerous interviews on TV and radio.